Chest pain is often an indicator of a heart attack. Even when it's not a heart attack, telling the difference will require some sophisticated equipment not readily available at a typical doctor's office. Chest pain is one of a few medical complaints that almost always needs emergency medical care, and should never be initially seen at a doctor's office. Heart attacks deprive the heart muscle of needed blood and oxygen. They are usually caused by a blood clot in an artery already clogged with cholesterol deposits. Since the blood clot blocks blood flow to the heart, muscle tissue (which can't stop beating to save energy because the heart is an essential organ) begins to starve. Eventually, the heart muscle will die. The time it takes for the heart muscle to die is different for everyone. It depends on several factors, not the least of which is the size of the clogged artery and the area of the heart being deprived of oxygen. The bigger the blocked artery, the faster the damage occurs. Hospitals measure success by how fast heart attack patients get treatment once they walk in the door. Doctors' offices aren't generally as efficient. It takes some specialized equipment to properly assess a potential heart attack, and most doctors are not equipped to handle these true medical emergencies. Besides the technological differences, individual doctors - especially general or family practitioners - just don't see enough heart attacks happening in front of them to always react appropriately. Even among emergency departments, those that see more patients do a better job of identifying heart attacks. One thing is certain in all heart attacks: time is muscle. The more time wasted before getting treated, the more heart muscle is destroyed, which is why emergency departments have protocols to follow for patients who come in complaining of chest pain. Once a heart attack victim visits the emergency department, there are several things he or she should get in the first few minutes. Few if any of these things are available at the average physician's office. Indeed, if a patient in the doctor's office is suspected of having a heart attack, the physician will probably call an ambulance to transport the patient to the emergency department. Going to see the doctor first will only result in delaying important treatment, and time is muscle. Now that we've established the need for treatment in an emergency department for all potential heart attack victims (which includes anyone with chest pain), let's talk about how to get there. Walking into a crowded emergency department waiting room means you have to fill out a form and wait for your turn to be evaluated. There will be a nurse in the waiting room to do an assessment, and that nurse will almost certainly recognize the signs and symptoms of a heart attack once he or she gets to you, but until then, you'll wait on a first-come, first-served basis. On the other hand, calling 911 will get you an ambulance. 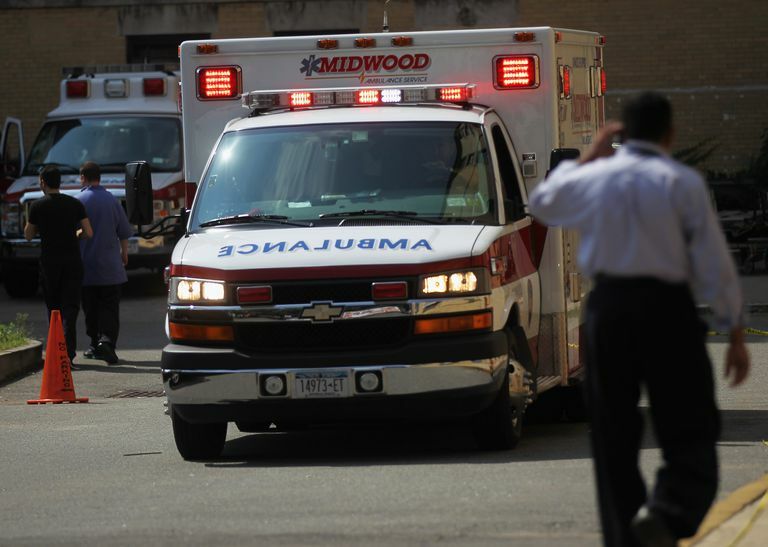 Currently, the national standard for ambulance response times in metropolitan areas is less than 10 minutes. By calling 911, you'll have at least two emergency medical providers - and depending on where you live, additional first responders - addressing your chest pain in less than 10 minutes. That's much better than driving to, and waiting in, the emergency department. In most of the United States, ambulances that respond to 911 calls are trained and equipped to handle many of the things a potential heart attack victim needs, all before ever reaching the hospital. Most ambulances don't do a diagnostic ECG yet (although that's changing rapidly), and of course, ambulances can't perform surgery. With those exceptions, a paramedic on an ambulance can start IV lines; give oxygen, nitroglycerin, morphine, and aspirin. As well, a paramedic will monitor your heart on the way to the hospital and is available to treat catastrophic events on the way to the hospital and is available to treat catastrophic events that may occur, like cardiac arrest - a very real risk during a heart attack. As emergency medicine evolves, so does the team that performs it. Systems and protocols are developed to address specific, common emergencies like heart attacks. These protocols have definite entry points where patients get the best outcome. Entering the chest pain protocol at the beginning, in your house with ambulance paramedics, has a better chance of success than delaying care by going to a doctor's office incapable of treating you. When treating heart attacks, speed and efficiency are essential. You shouldn't take your chest pain to your doctor's office because time is muscle. Limkakeng, A Jr, et al. "Combination of Goldman risk and initial cardiac troponin I for emergency department chest pain patient risk stratification." Acad Emerg Med. 2001 Jul;8(7):696-702. Schull MJ, Vermeulen MJ, Stukel TA. "The risk of missed diagnosis of acute myocardial infarction associated with emergency department volume." Ann Emerg Med. 2006 Dec;48(6):647-55. Epub 2006 Jun 14. Zucker, DR, et al. "Presentations of acute myocardial infarction in men and women." J Gen Intern Med. 1997 Feb;12(2):79-87.